Are you a CBAA member and interested in being considered for our featured artist section? Email a link to your website or 3 images of your work to admin@collegebookart.org. We will contact you with more information. Karen Baldner grew up in Germany and completed her formal studies in the US with a Masters Degree in Printmaking at Indiana University, Bloomington. Karen teaches at Herron School of Art && Design, IUPUI, Indianapolis, Indiana where she built a Book Arts Program that leads to a Minor in Book Arts. 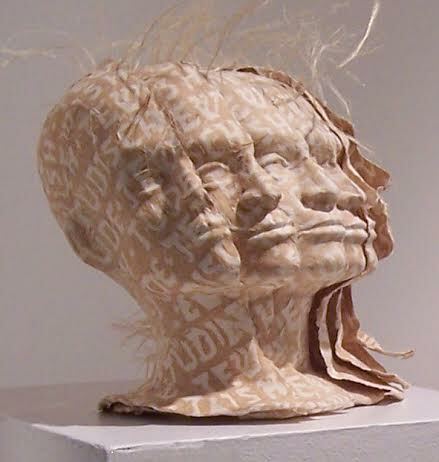 The program is integrated into the Printmaking Department and serves undergraduates and graduate students. It encompasses courses in letterpress, paper making, paper engineering and the study of book structures. 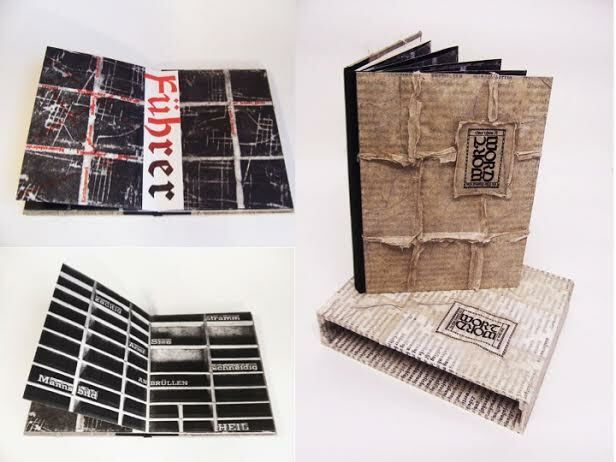 Integrating the Book Arts into an academic setting has revealed that the medium lends itself particularly well to the art school environment. Books straddle all four dimensions and tend to unite (rather than divide), bringing students together for a solid interdisciplinary learning experience. At Herron, students from all aesthetic sensibilities work in the Book Arts: Printmaking, Painting, Illustration, Drawing, Photography, Graphic Design, even Sculpture, Furniture Design, Ceramics, Installation, Time Arts, Performance, and sometimes from others fields such as History, English, or Informatics. Next to building solid craftsmanship, Karen challenges students to claim the book as an expressive format, to push the definition of the book, and to engage with the melding of narrative and structure and the significance of physical engagement with the viewer. Once Upon a Word, 2013, maps through the grid of the letterpress toxic language from the Nazi era. Specific German vocabulary is fraught with a sense of taboo that becomes deflated by it’s translation into English. Karen is interested in exposing the emotional toxicity of language in it’s isolation from it’s source. Drum Leaf binding with slip case, lithography and digital printing on handmade paper with image stencils and Rives Lightweight. Cover and slipcase: quilted handmade flax paper with embedded hair. 8” x 5” x 1.5” Edition of 2. Bjorn Krondorfer, “The Jewish/German Dialogue Project”. "Here we ask ourselves if we can navigate between remembrance of the Holocaust and respectfully distancing ourselves from it. Is it permissible to live in the present with joy in spite of the burden of history? We invite the reader to explore this issue cautiously by tracing the ghost-like text with all of their senses. The girdle book format allows for an element of weight as well as intimacy as the book is carried on a belt in the folds of one's clothing." Letterpress embossed with 42 point Bulmer, Italic, and 36 point Courier. Colophon and images digitally generated. Handmade cotton rag paper with horse and human hair. Sewn onto double raised cords with felt over boards. Bound as a traditional medieval girdle book. Metal clasp closure. 6” x 4.5” x 1”, 16” high with skirt. Edition of 5. German/Jew, 2005, is about Karen's dual identity as a German and a Jew, and how it feels to belong to two divided cultures after the Holocaust. Currently Karen is working on a collaborative project with artist papermaker Drew Cameron, director of the Combat Paper Project. They are making a book structure that showcases all papers that the Project has transformed from US combat uniforms in a format that compares them simultaneously. 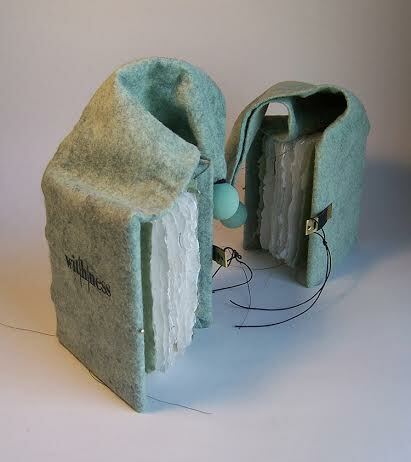 This project has been generously funded by a Project Grant from the College Book Arts Association.